Hello and happy Friday!!! I have a card to share with you today that doesn't use Copics, Watercolor brushes, or any pencils, and it was sooooo much fun!!! To make the flowers, all you need is Distress Oxide Inks, a positioning tool (I used a Misti), a waterbottle (I used a Distress Sprayer), and your choice of stamps. 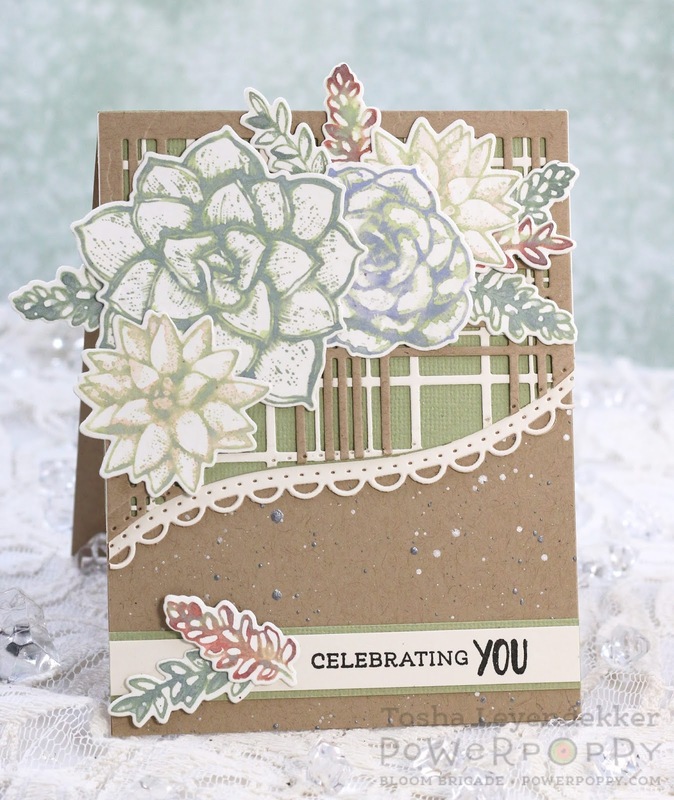 I used Power Poppy's Succulent Singles set with coordinating Succulent Singles dies. It's a pretty easy process if you have a Misti to work with because the stamp stays put and you can realign everything lickety-split. The stamp images I used are clear, so I would be able to line them up with a stamping block too, but my eyes aren't what they used to be. I started by inking up one of the succulent images with the Distress Oxide color I wanted for my base (the one that is going to spread out a bit and not give a defined line). I spritzed it thoroughly 3x, stamped it, and dried it with a heat tool. (the ink travels a bit) I then inked the image up again with a different color. Depending on how defined I wanted the lines, I either spritzed the image once, or not at all, and stamped directly over the now dried image and used my heat tool again. Lastly, I diecut them all out and arranged them how you see here. 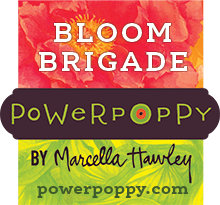 Before I go, I wanted to make sure you've seen all the new fantastic new Digital images Power Poppy released this week. I haven't had an opportunity to work with them yet (we're camping right now), but let me tell you, I'm "chomping-at-the-bit". Marcella's vignettes are like not other. Nothing compares. They are all a complete delight. I hope you'll give them a try. There is even a free Digital Gerbera set called Kindness is the Way, and IT...IS...F-A-N-T-A-S-T-I-C!!! It's being offered by Kit and Clowder as a free coloring class too. Thanks for visiting!! I hope you are having a a blessed weekend!! I was sure to "pin' this as I want to refer to it. 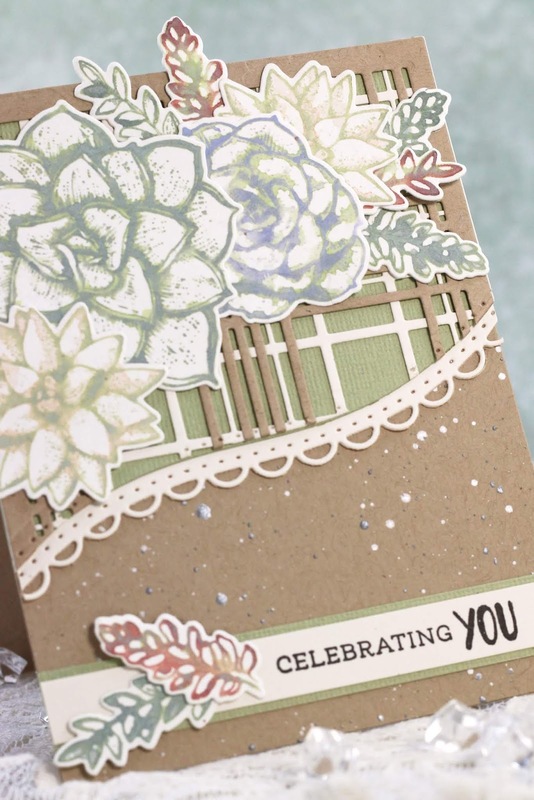 I love the soft colors and the special feel of this card. It is dreamy and the choice of colors is so unusual. Love it all. Love your cards! You are an amazing colorer! !